My friends, the lovely folks at Apartment Therapy Nursery did a story on Otis's play areas, which you can check out if you're interested in looking at pictures of our house when it's clean (ha!) and there's no toddler around to marr the immaculate placement of props (double ha!). And below is a tutorial on the bulletin board we made to display Otis's artwork. Ever since I saw a story in an old Martha Stewart magazine, I've been wanting to make myself a homasote bulletin board. For those of you who don't know about homasote, it's a type of building material made of recycled paper. It can be used as soundproofing, and makes for fantastic bulletin boards, either plain, painted, or covered. Our architect told us that they used to it construct inexpensive room dividers in their studios in school. Since then, I've seen lots of beautiful bulletin boards, like here. But me, I wanted to cover entire walls with the stuff. And maybe I'm a simpleton, but I couldn't quite figure out the logistics of how to do it - most information I found was a little evasive about how to actually mount them to the wall. And when I finally dug out the actual issue of Martha Stewart (yes, we have a basement full of them!) that had the how-to, I saw that they used wood trim to help hold up their homasote, which wouldn't have worked in our space. So here's what we did instead. Everything I've read online tells you to have the lumber yard cut the homasote for you, and it's really good advice. We had to borrow a circular saw from our neighbor to cut ours down to the proper size (and I waited for F to come home so someone could drive me to the emergency room in case I cut something off and couldn't drive myself), and even though we did it outside, we were sneezing paper bits for the next week. 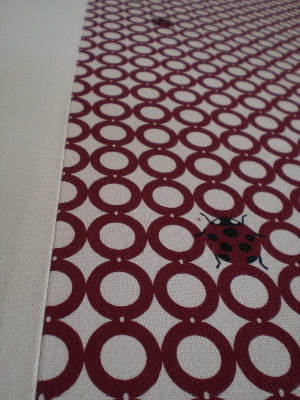 I wanted to cover our bulletin board with this beautiful Etsuko Furuya fabric, but thought that a big wall of it would be overwhelming (and more expensive) so I sewed a strip of it between two pieces of regular canvas, making sure to line up my pattern so it was straight (oh how I love those ladybugs). After we finished, I wished that I had centered all the ladybugs, but oh well, c'est la vie. 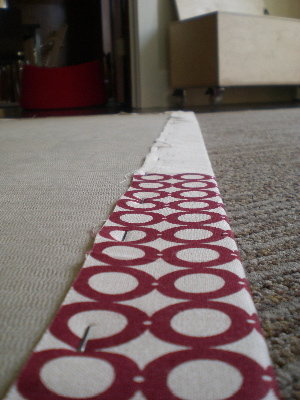 Using a staple gun, staple down the center of one side, then the opposite side, making sure the fabric is nice and taut. Work your way from the center out towards the corners. Since our fabric had a pattern, I tried to line up the edge of my dots with the edge of my homasote so that it would look straight. 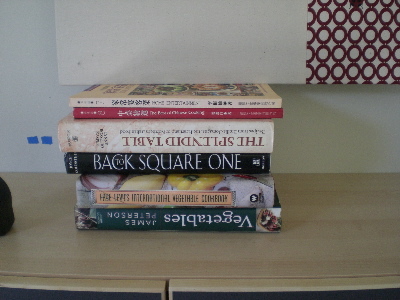 I folded the fabric on the corner this way (which I picked up from book making), since it created less bulk with our thick fabric. I pulled the point of the fabric down over the corner of the homasote, creating a 45 degree angle. 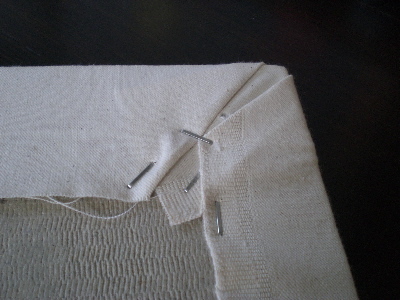 Then I folded down the two sides of fabric, tucking the excess in along the sides. 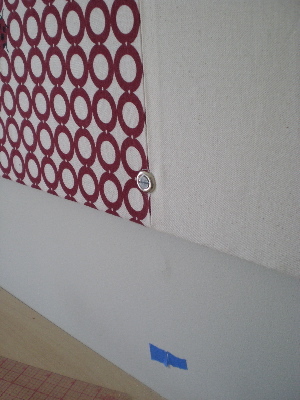 Try to make it as streamlined as possible so that there's not too much fabric between the bulletin board and the wall. We used our stud finder to locate studs behind our drywall and marked them with painter's tape (you can see the blue tape below). This is pretty important since the bulletin board is so large and heavy (ours was 3' x 7'). I suppose you could also use anchors with your screws, but that still makes me a little nervous. Studs are better. We ended up attaching our board into four studs and two anchors (they're not evenly spaced because we wanted to catch studs and have screws at all four corners). We used a stack of books to help us hold up the bulletin board so we could step back and look at it. 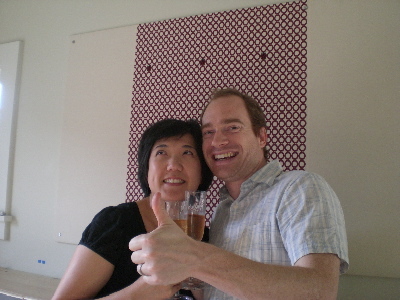 We double checked with a level and then predrilled holes, both in the wall and in the bulletin board. 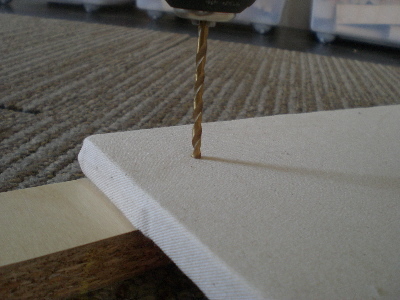 Start out slowly when you drill through the bulletin board because it will catch and torque the fabric (and don't forget to protect your floor!). We used nice long wood screws and finishing washers, both to protect the fabric and to give it a more finished look. Sit back and enjoy your handiwork. Now go force your child to be creative so you have something to hang up. Edited to add: I've received many emails asking me about where to buy homasote. I didn'see any at my local Home Depot, but other people have reported finding it where they live, so it all depends. It seems that you can reliably find it at good lumber yards, though, which is where we bought ours. Then you'll have the added bonus of feeling good that you supported your local business!